I haven’t had the easiest of pregnancies, but I’ve learned that no woman really does. I swear pregnant women are like snowflakes; we all have our own special brand of pregnancy and the wonderful “gifts” that come along with it. This realization was both refreshing and alienating for me. You see, when you don’t know anyone who’s experienced what you have (read: constant metal mouth) you start to feel this odd sense of loneliness. It’s just you and your symptoms. 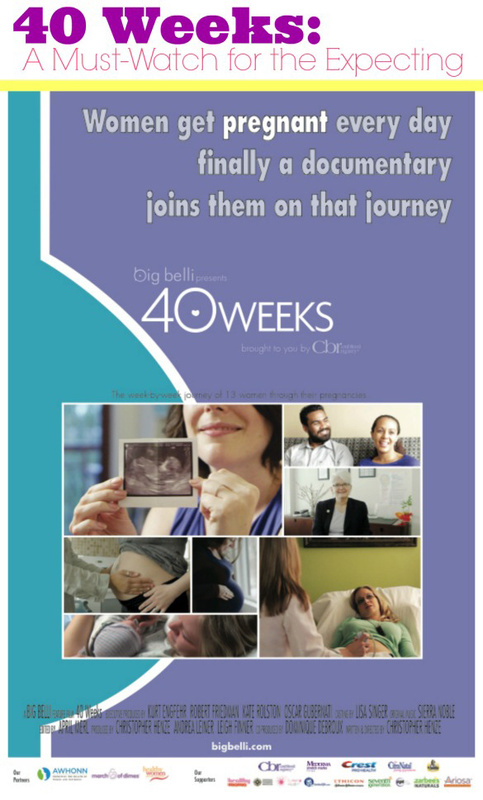 It’s that particular loneliness that made me appreciate Christopher Henze’s documentary, 40 Weeks so much. I felt reconnected to the world after watching these women’s stories. It was the perfect gift to bring me out of isolation. The documentary focuses on a diverse group of mothers; they come from different backgrounds, races, cultures, ages, sexual orientations. They’re basically a beautiful tribe of diversity, which was the perfect move if you’re looking for women to identify with your message. I saw little pieces of myself in every mother-to-be. One would share a symptom I had and I’d laugh out loud at our similarities. Then another would share something she had experienced with her husband and I’d snort-laugh a nod of understanding. I loved that there was a variety of experiences, situations and life events. I wished immediately I would have seen this in my first trimester and now will push all of my newly expectant friends to watch. There’s no right time to watch this movie, but I really felt my loneliness in the first trimester when we were on secret-and-sickness lockdown. It went so beyond what any book has been able to do for me. These women are real, hilarious and full of grace and love. I cried too many times to count. The movie is a bit long, running at a little over one hour and fifty minutes; but I appreciated watching this as a screener — I was able to pause and take as many bathroom breaks as I needed to. Basically the creators knew who their audience was. Honestly, I could have watched more. You just never can get enough of hearing stories similar to your own; relating to women experiencing the same, crazy wonders that you’re experiencing. Bleeding gums, hemorrhoids, baby kicks, our partners’ experiences are all included; no topics are off limits; no story or feeling spared. Sometimes you just want to hear other mothers say that they’re happy and thankful, but still dislike pregnancy. It takes a load off! I could go on and on about how much I needed this film. If you’re pregnant or know of someone who is, I encourage you to watch. The film is currently on tour through January 13. Click here to find out which cities are hosting. There are also opportunities to host private screenings if you have a gaggle of gal pals who are interested. If screenings aren’t your bag you can always purchase the DVD in March.